Following a nine-day workshop in Taipei, a group of young democracy activists from around Asia elaborated various strategies to tighten regional cooperation and facilitate information-sharing in times of democratic recession. Alison Hsiao reports. 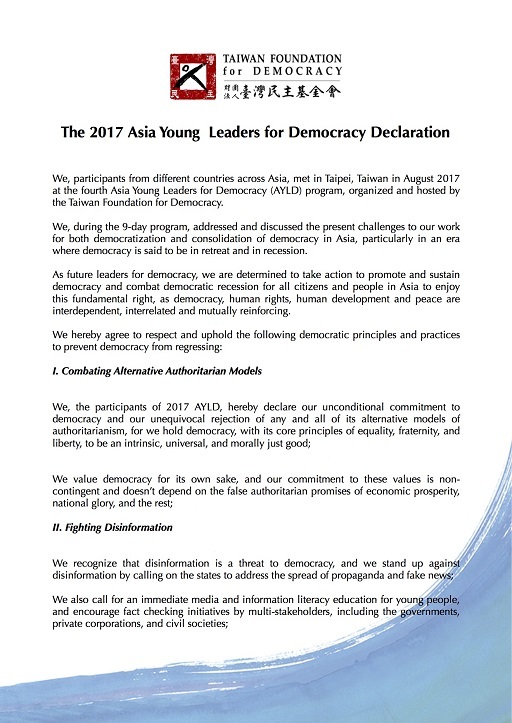 At the conclusion of a nine-day Asia Young Leaders for Democracy (AYLD) program hosted by the Taiwan Foundation for Democracy (TFD) in Taipei earlier this month, young participants from around Asia issued a document that is known as the AYLD Declaration. Covering a wide range of issues, the declaration was drafted by the 20 participants, most of whom come from countries that face many challenges in achieving or sustaining democracy. In itself, the fact that a declaration was issued by a group of young people with different national backgrounds can be hailed as an accomplishment. As many of us know, consensus is rarely the outcome of official region-wide conferences. Still, adopting a declaration that could be approved by all through a democratic process nevertheless proved challenging, which the young democracy advocates knew all too well from their own experiences back home, where efforts to discredit democracy have been gaining momentum. As the democracy-skeptic camp often argues, efficiency, ostensibly key for development, often suffers from long democratic procedures; so if a trade-off at the expense of democracy is the inevitable cost, then so be it. Consensus-building isn’t easy, even among ardent supporters of democracy. 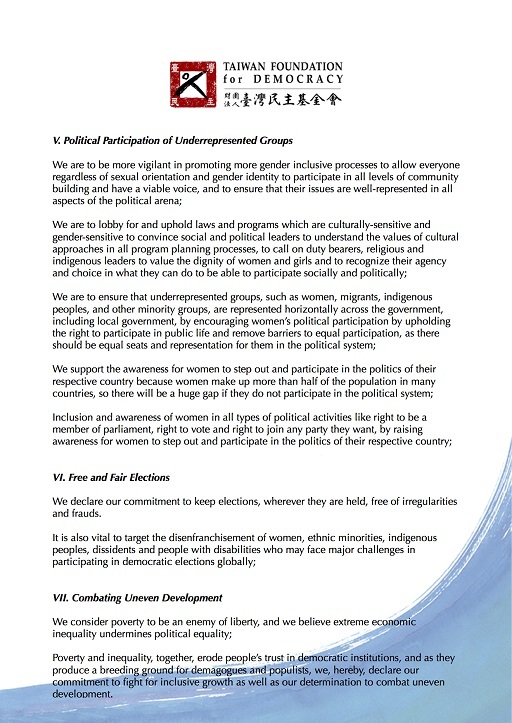 As democracy is said to be in recession with the rise of “illiberal democracy,” the young democracy leaders responded to the trend with an emphasis on fighting disinformation and extremism (Clause 2 & 3), which serve as incubators for and are the product of illiberal democracy, respectively. The declaration also contains much evidence that the young democracy leaders fully understand what democracy is not: majoritarianism with the majority having all the say. Votes may be necessary, but deliberation and compromise among groups and people, with members of a program or a community having equal rights and access, are indispensable. 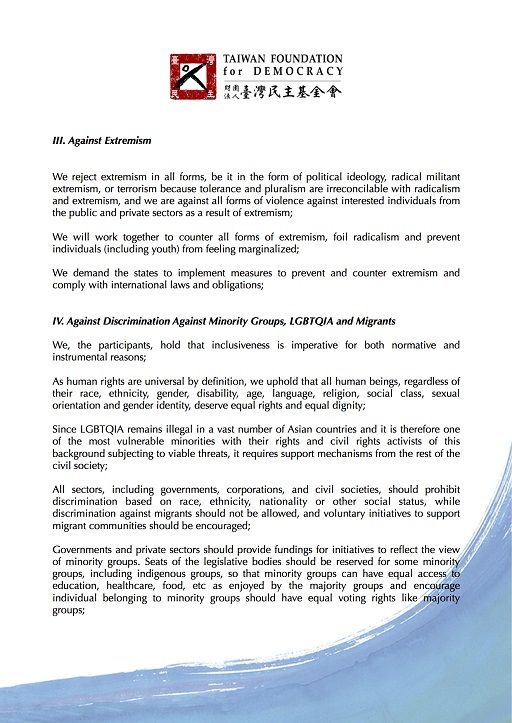 The rights of minority groups and political participation have to be guaranteed (Clause 4 & 5): “All human beings, regardless of their race, ethnicity, gender, disability, age, language, religion, social class, sexual orientation and gender identity, deserve equal rights and equal dignity,” the declaration says, following a debate on whether “women’s political participation” should enjoy a highlighted focus with a separate clause. “Democracy needs time” could also be taken to mean that the realization of true democracy is a long haul that requires people, especially the young, to resolutely and actively engage in monitoring, maintaining and improving the democracy agendas in their respective countries. The task, however, can be particularly daunting for those who live in countries where governments wield power without proper checks and where people in general are ignorant about (or nonchalant) human rights violations. Inter-country and regional alliances and cooperation are therefore essential for activists and dissidents for the sharing of hands-on experience and solidarity building. To this end, the 2017 AYLD participants came up with three action plans to strengthen the network they creatdd during the program and the principles they have vowed to uphold in the declaration. The Asia News for Democracy has been set up and will serve as a platform for Asia-related news-sharing to enhance regional partners’ understanding and facilitate networking initiatives. Moreover, two types of workshops have been proposed to promote democracy and its consolidation: a workshop at the country-level on disinformation for schools and organizations to improve young people’s information literacy and skills to combat “fake news”; and regular regional joint workshops to building regional communities and share first-hand information to young human rights defenders, with a focus on cyber security, utilization of new technology, legal training and protest-organizing strategies. AYLD participants break into small groups as the project drafts its declaration. The people behind the idea of holding regional workshops also agreed that lessons can be learned not only from what works, but also from failure. Stories of botched-up tactics and flops can be just as educational and rewarding as those touting successes. In the long run, they said, failure can be a series of steps and milestones leading to success. Two visits by AYLD members — to the Jing-mei Human Rights Memorial and Cultural Park and the Nylon Deng Memorial Museum — drove in the fact that failure can be but a temporary setback. While both sites are dedicated to activists and dissidents who “failed” in the face of an authoritarian regime, today they are now remembered with respect and pride, and the principles they fought for have prevailed over the forces of repression that, at the time, seemed implacable.